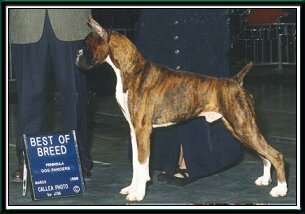 Derby started his show career as a 7 month old puppy taking his first 3 point major Breeder/owner handled by Pat Russell. 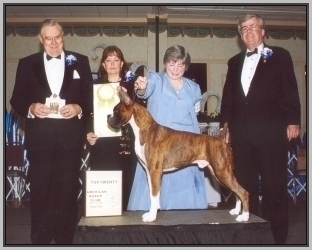 He went on to win Best Puppy In Show and finished his championship with back to back majors. 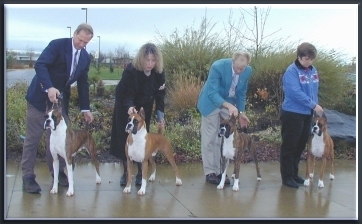 Derby now has many group placements several group ones and several BISS. 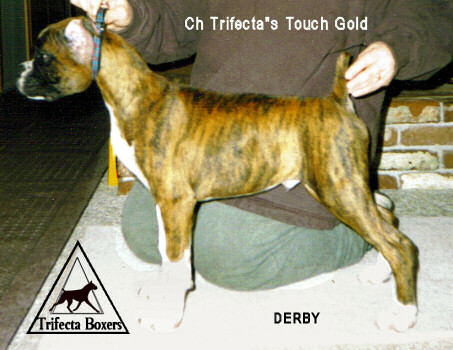 Derby has many puppies competing in conformation see pictures below. We think he looks a lot like his Grandpa Leo. 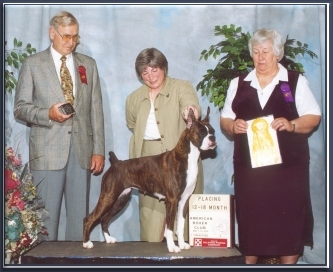 Derby fininshed his Canadian championship in one weekend. All before the age of two. 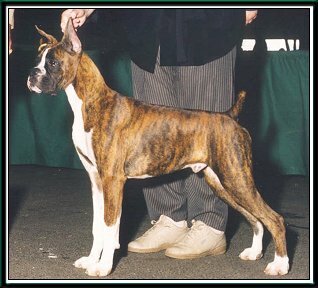 Derby is a two time qualifier for the "Top Twenty" boxers in the USA. 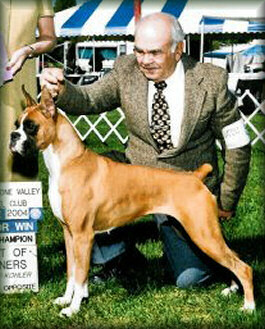 In 2000 he traveled to the national and competed with the other Top Twenty qualifiers. 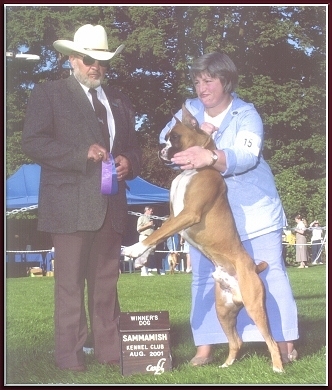 Derby showed very well and scored the runner up. 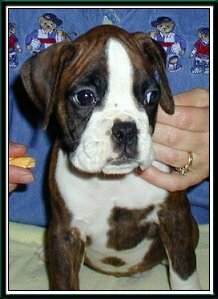 Now Derby is making his mark in the whelping box. 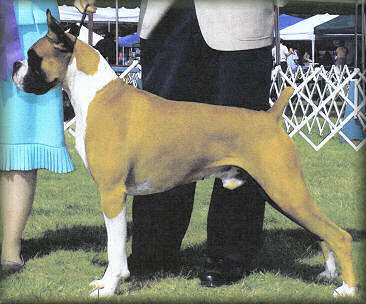 Below is his first champion Classy. 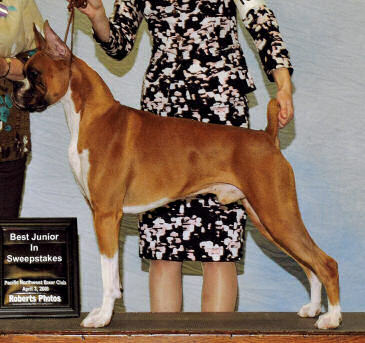 Classy captured several Grand Sweepstakes wins on her way to completing her championship. 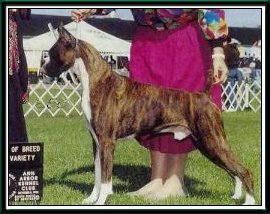 Three Derby get are being handled by junior handlers and competing in the juniors classes as well as the regular conformation clasess. 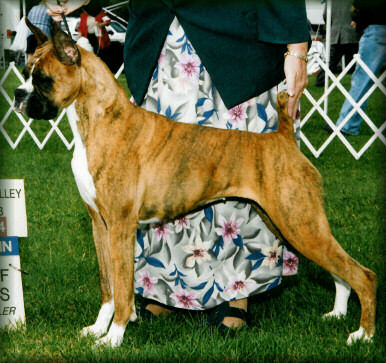 Many other Derby puppies are owner handled in the classes. 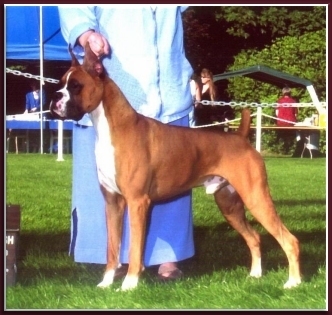 In Boxers most dogs are handled by professional handlers in the conformation ring. 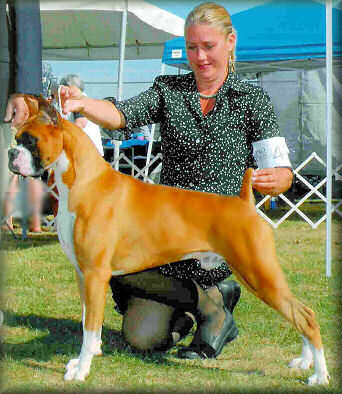 Many of Derby's get are being owner handled.... a testiment to the puppies temperament and trainability. 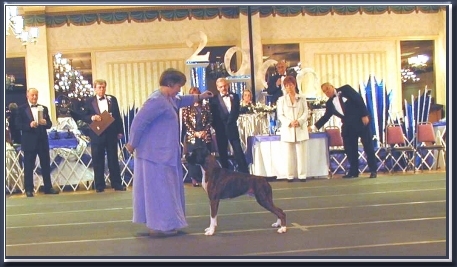 We are extremely proud of all the puppies Derby has sired and the owners who want to compete with their own dogs and have the fortitude to go into the ring, and compete, with all the paid professionals. 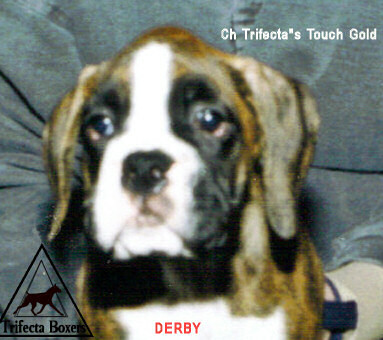 Many Other Derby Puppies are having some great wins. We love to get pictures and will happily post with new wins. 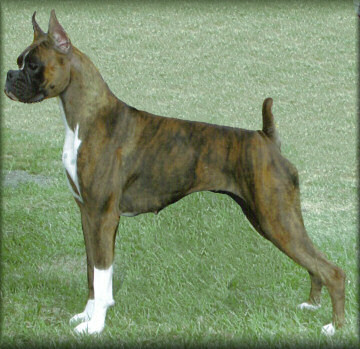 The others have points or reserves in their limited showings. Ollie has some of his fathers comedic actions. The photographer unwisely threw a ball. 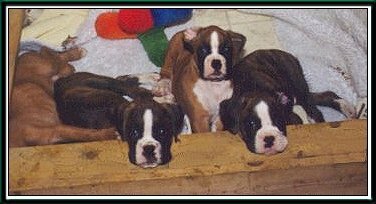 Litter sister to the two boys pictured above on the left. 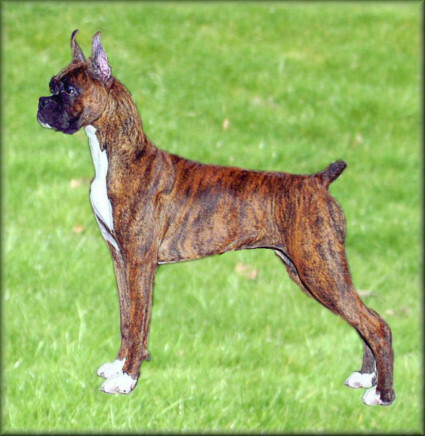 Roses is pictured at 7 weeks. 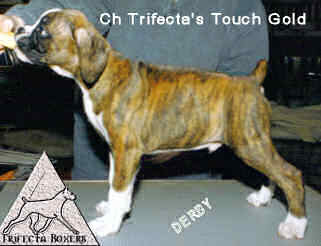 Link to Trifecta Boxers contents page below.